Имате въпрос към Prestige Vacation Apartments? Prestige Vacation Apartments, който се намира в Багио Сити Пропър, Baguio, е популярно място за туристи. Този 3-звезден хотел е леснодостъпен, тъй като е само на 5 km от летището. С удобното си местоположение хотелът предлага лесен достъп до всички градски забележителности, които задължително трябва да се видят. Prestige Vacation Apartments предлага безупречно обслужване и необходимите удобства, за да удовлетвори гостите си. За удобството и комфорта на гостите хотелът осигурява безплатен WiFi достъп във всички стаи, съоръжения за инвалиди, експресно настаняване/напускане, съхраняване на багаж, Wi-Fi връзка в общите части. Атмосферата на Prestige Vacation Apartments се усеща във всяка стая. Удобства като телевизор с плосък екран, достъп до интернет (безжичен), безжичен интернет достъп (безплатен), стаи за непушачи, бюро са само някои от даденостите на обекта. Хотелът предоставя най-добрите съоръжения включващи фитнес зала, сауна, голф игрище (в радиус от 3 км), детска площадка, билярд, които ще Ви помогнат да отпочинете след активен ден прекаран в града. Prestige Vacation Apartments е добър избор за всички посетители на Baguio, защото предлага спокойствие и безпроблемен престой. The location is great, close to everything. I have stayed here several times and enjoyed it each time. The apartment many is Very friendly and helpful. I would recommend this place to all my friends and family when ever they go to Baguio. My family was very pleased with our stay last Dec 13-15. We were planning to stay just for a night and will look for a hotel the following day but when we entered the room, we immediately decided to extend our stay. Will definitely come back. Kudos to Zeny, our contact for her hospitality. Our stay was made so great with Prestige Vacation! The staff were so accommodating and understanding of our predicament when we arrived way passed our check in time. They also kept constant communication during our stay to ensure that we are well taken cared of and our needs answered. The room is great for big families with children, it is clean and they provide enough blankets and mats for us. I highly recommend this place! I really appreciate Zeny for letting use a different room since we have an elderly. The place was so clean and relaxing. I would definitely stay here again The only thing that bugs me was during check out, a different person checked our room. And when she asked for my deposit slip I told her that it is inside my car, and asked her if she could accompany me since there is a typhoon coming and we are in a hurry to go back to Manila, she insisted that she will just wait upstairs since we are there already. (we could have save time) But nevertheless, I enjoyed our stay and the place was awesome. The apartment has everything we needed. The grocery is about 500 meters away so you can buy fresh goods and cook anytime you want. Restaurants are also near. It’s far from the busy Session Road so you will rest and sleep without the city noise. Best stay in Baguio yet. First of all, the name of the property is not PRESTIGE VACATION APARTMENT, it is BONBEL CONDOMINIUM. You shouldn't put different name online then when the client will arrive they will discover that the property is far away from that PRESTIGE VACATION APARTMENT, it is a really bad experience for us specially that we have infant with us. It's a apartment yes but asking you to clean the room before checking out is really horrible, we pay and stay in Baguio to have a good and relaxing vacation, not to be a housemaid of our own accommodation which is very wrong. We pay for our stay, it's not like we stay for free. Some points to highlight: Location- We stayed in their one-bedroom units at Bonbel Condominiums. (Note that their 5-bedroom units are located at Hanbi Mansions). Bonbel Condo is close to SLU and restaurants along Leonard Wood. Cleanliness- The place is clean. No smells or hairs clogged in the bathroom. The extra bed provided is a bit shabby but clean. Towels and linen smelled like new laundry. Staff- Ms. Belle is very gracious with directions (Waze pointed us to Hanbi Mansions and we got lost looking for Bonbel). Facilities- The place has complete kitchen amenities for cooking. It also has a phone and a complete list of food delivery options should you decide to order out. Space- The place has a spacious living room that my children can ran around and play. We stayed in Hanbi Mansions for 3d2n from June 1-3, 2016 with total of 15 guests, 3 of which are kids below 12yo. The place is huge and can fit a large family like us as it has 5 bed rooms and large sofa to where you can sleep as well. There is a working water dispenser for which they provide 1 refill per day. They also provide bath towels and tissue paper but you need to bring your own toiletries, which is fine since there are sari-sari stores near the vicinity in case you forget. Not just stores, but there are other walking distance places to where you can dine and take your kids like wright park beside it, volante pizza place and the famous ketchup community to where you can enjoy yummy food that also has huge servings and very affordable too, like CANTO! One of the best ribs we ate for only P400 with rice and salad on the side. It already serves 3-4 persons! They also have lychee and strawberry lush for only P50. Going back to the feedback in this place, it's very cozy and the guards, staff and manager (Ms. Bhelle) were very accomodating. We would definitely recommend and come back if we visit Baguio again. Thanks and kudos Hanbi Mansions! We stayed in 2 br apartment It's spacious & clean with kitchen full of utensils so you can cook your own food. Location was very great not far from session road were SM mall and lots of shops and restaurants. 5 litres of water provided to use on cooler. The place is very secured. Taxi can be called by the guard who is available on duty 24 hours. Also botanical garden is about 1km from the place. Must mention Ms Bhelle the premises manager who was very helpful and so attentive. Would definitely stay there on my next visit to Baguio. We've truly enjoyed our stay at Prestige (Hanbi Mansions).We are a large group (13people) and we did comfortably fit at the apartment.There's 1 master bedroom,with extra 4 rooms with multiple beds and 3 bathrooms. Wi-fi was extra fast despite of everyone connected to it. There's the veranda from which we enjoyed the morning view and sipped our coffee and drank our rums&beer the night before. It was truly relaxing as everyone would have their own spaces. It didn't felt crowded at all. They have a complete set of cooking wares and eating utensils as well and free supply of drinking water so you never have to worry of getting hungry at all.All you need to do is do your groceries.There's television below and up the stairs as if you are at your own home. 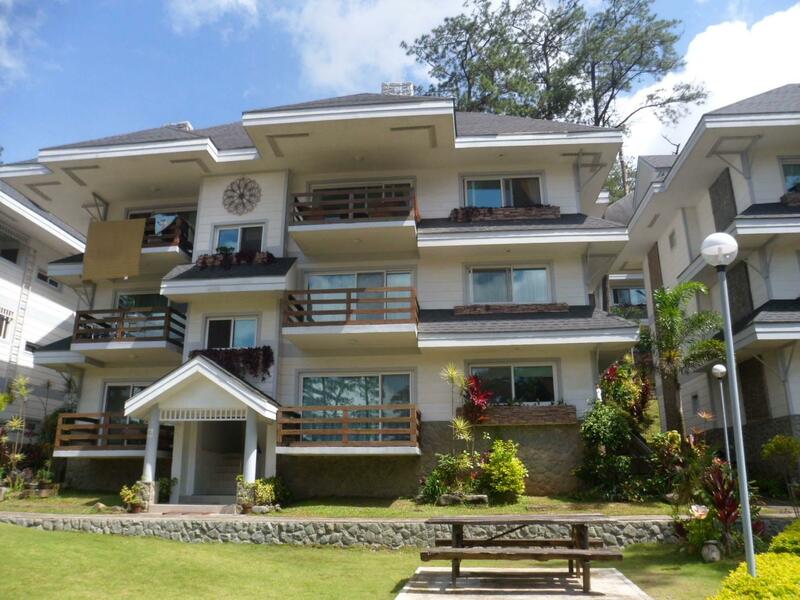 It's a walking distance to Wright Park and The Mansion and short travel to Baguio Technohub and Good Shepherd. I wilk recommend this to those who's travelling in large groups as everyone will absolutely fit. We had a very relaxing and enjoyable stay at Prestige. The place is suitable for families - child friendly, spacious and with complete amenities. I highly recommend the place to all moms out there who want nothing but safety and comfort for their families, especially the little ones. The whole apartment unit and common areas are very clean and well kept. 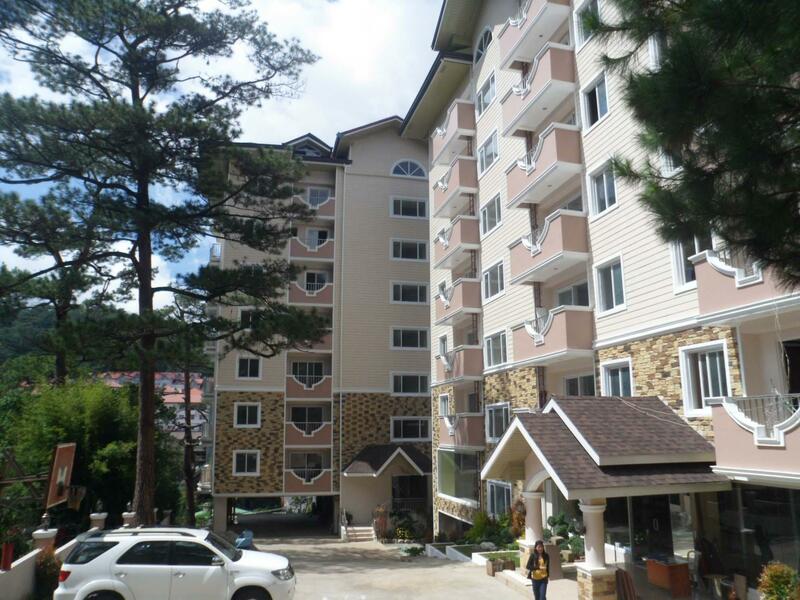 The location is also strategic and within short distance from various tourist spots in Baguio. It felt like home away from home. We will definitely go back to Prestige in our next trip to Baguio. Since I need to clean my kids feeding bottle, I booked a condo instead of hotel. Facilities and location is very good. I like the unit, its just nice for 3 adults and 2 kids. This is not our first time to stay with Prestige. We really enjoyed our stay there a few years back that was why we decided to go back there. The location was really good, it was spacious, and it was a comfortable stay. However, this time I only had two concerns. One was the place was showing its age. The handles on the cabinets were loose. The shower was not working in both comfort rooms. We had 2 two toddlers during our stay and warm water was a necessity for taking a shower. Another was the way the staff dealt with a particular concern of our group. An emergency led our group to check out really early. It was really an unusual situation, and I understand that the staff was caught off guard with our request. However, I felt that the staff could have handled our concerns better had they not given us excuses and subtly tried to get us to adjust our departure time for their convenience. Overall, it was still a comfortable stay and it's relatively cheap. The Condotel unit was clean and cozy. Location was perfect and was very close to the popular tourist spots and restaurants. Please do not expect any room service so you need to buy and bring your own stash of food, the place had all the kitchen amenities anyway. No need to buy water since there is a water dispenser provided. I also appreciate the Security Guard 'Louie' she acted like our 'Bellboy' and was truly helpful and extremely pleasant, same with Zeny who was the landlady who was very warm and friendly. Since this is not a hotel please do not expect any cleaning service or call-in room services of any kind, I think you need to inform them if you want the room cleaned but it comes with an extra charge. We stayed in the 1 bedroom unit and I was not disappointed with the spacious unit that had a ready extra matress and a sofa bed if you have a driver or extra guest, very different from my usual hotel experience in Baguio that had limited space and very tiny rooms. Overall, I would definitely come back and stay here again. Манастир и параклис "Розовите сестри"